Are its lightning-fast workflow and editing tools worth the price? Photographers on the Mac could be forgiven for feeling a little spoilt for choice at the moment. No sooner has Aperture 3 been released and awarded four and a half stars, than Adobe's workflow software, Lightroom 3, goes gold and presents users with a difficult choice. The core concept of Lightroom is similar to Aperture's: manage your photographic workflow from the moment you plug in your camera to exporting your finished images to the web or print. As with Aperture, the location of your images on your hard disk is unimportant – once pictures are copied you can arrange them into custom collections, or set up smart collections that automatically draw files into them if they meet certain criteria. Lightroom's main advantage is its speed – working with huge libraries of files is fast and efficient. Lightroom's image processing engine is based on Adobe's Camera Raw, and the new version has an improved noise reduction tool. In previous versions of Lightroom, reducing noise meant walking a fine line between cutting grain and retaining detail: in the new version, that fine line has been thickened, enabling you to cut more noise while maintaining sharpness. A new film grain feature has also been added, enabling you to replace random speckles of noise with a pleasing film-like effect. Other features help Lightroom retain the editing edge against Aperture, such as the lens profile tool. This enables you to select the lens you used to take a shot and have your images automatically corrected. So if you have a lens that produces chromatic aberration, vignetting or barrel distortion, Lightroom can attempt to correct automatically. Unsurprisingly for software aimed at committed amateurs or professionals, expensive Canon and Nikon lenses get the best coverage, although a free tool on Adobe's website should see more lens profiles released over time. Lightroom still leads the way with tools such as its graduated filter. Also new to this version is a feature Aperture has had since version 2 – tethering. If you have a supported Canon or Nikon camera (this includes most recent mid-range and above models), you can shoot straight into a Lightroom studio session – useful for studio-bound photographers. It works well: a raw file took a little under five seconds to migrate from our DSLR into Lightroom after clicking the capture button. The slideshow feature has a fresh coat of paint: for the first time you can output a finished slideshow to an H.264 MP4 file. However, although you can add your own soundtrack, Lightroom 3's slideshow capabilities pale in comparison to Aperture's. Lightroom will now recognise video files from your DSLR, for instance, but you can't run them into a slideshow. There's also less control over transitions – the fade being the only option available. Aperture's ability to create stunningly finished photo books remains unchallenged. That's not the only place Lightroom lags – Aperture leads the way for consumer-friendly touches such as face-recognition and geo-tagging. But Lightroom offers a more powerful suite of editing tools, and its new noise-reduction tools are second-to-none. If you're a professional it comes highly recommended, despite costing around £60 more than Aperture. 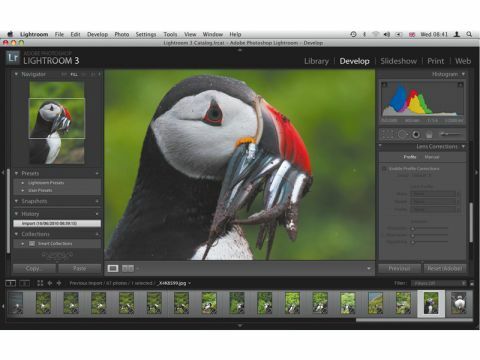 It's also a no-brainer upgrade for existing Lightroom users at £75.